Current Affairs MCQs 21 to 30 June 2015 (Quiz No. 173) : India General Knowledge (GK) Sample Question Paper No. 173 with Collection of 10 Question of India GK Questions under GK Quiz in PDF @ India GK Sample Papers. 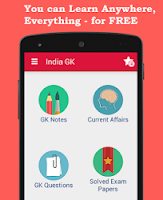 India General Knowledge (GK) and General Science (GS) Questions for UPSC, State PSC, SSC, Police exam, Railway exam, SBI, Bank PO, IBPC, SSC, LDC, UDC, Army, Airforce, Navy, Coast Guard, Bank Clerk, TET and all entrance examination with current affairs News, Multiple Choice Questions (MCQs) available on Website www.IndiaGK.com and Android Apps with daily updates:. COPA America Football tournament 2015 is hosted by which country? Ustad Amjad Ali Khan has been awarded this year’s Swathi Puraskar by which government ? Prime Minister Narendra Modi was awarded by Highest Civilian award by which country in June 2015 ? PM Narendra Modi on 25th June 2015 launches three schemes, which among following is not among these ? Who recently won the Indonesia Open Badminton women's singles title? Which country has won the 2015 FIFA U-20 World Cup by defeating Brazil 2-1 ? Mansoon Session 2015 will begins from ? India have slipped to _________________ in ICC Test rankings after a draw against Bangladesh ? Integrated Power Development Scheme (IPDS) was launched by PM on 28th June 2015 at ?